Numerous educational activities and games, including some in Spanish and at different difficulty levels, have been developed and are available for anyone to download. *Special thanks to Africam Safari (Mexico) for contributing bilingual activities! 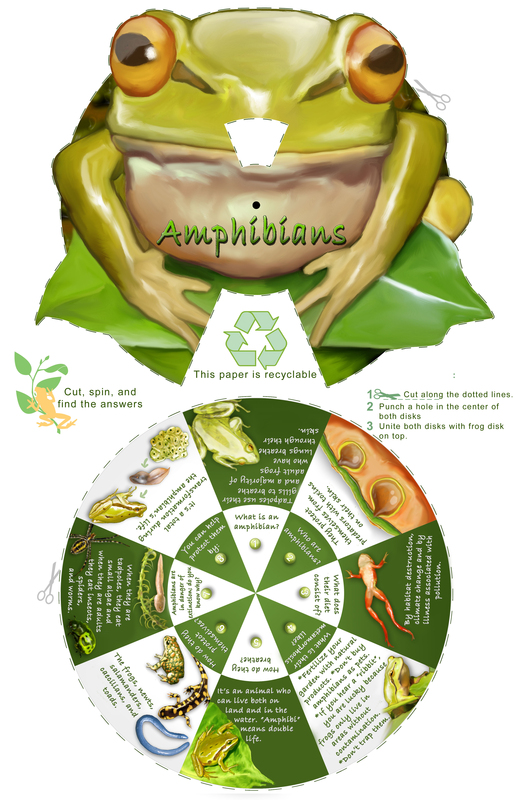 Several types of amphibian conservation outreach materials, including posters, fact sheets, handouts, outreach program animal recommendations, and adaptable amphibian articles, have been developed and are available for anyone to download. Fact sheets, describing the amphibian crisis and the conservation actions AZA-accredited zoos and aquariums take towards alleviating this crisis are available for for volunteers, docents, educators, media communications, or anyone else to download. An AZA handout entitled “Top 8 Ways to Help Frogs” is available as an individual handout card or a full sheet of ten wallet-sized handout cards for anyone to download. An AZA Recommendations for Reptiles and Amphibians Used in Outreach Programs document has been developed for use as a resource to identify some of the more common species that have been safely used in educational outreach programs. An AZA article entitled “Responding to Amphibian Declines During Year of the Frog” describes the amphibian conservation crisis and the zoological community's response to amphibian declines in preparation for the Year of the Frog. The article can be adapted to describe future efforts and is suitable for newsletters or magazines.